Building a website and building a house have many things in common. This analogy is very helpful if you aren’t familiar with the web development process. It can better help you understand the requirements before we can estimate or build your site. Custom homes usually cost more than manufactured homes. It’s the same with websites. A custom-designed, custom-built website will cost more than a website built from an off-the-shelf design template. Why does custom cost more? Simply because it’s exactly what you want and/or need, not a pre-packaged product for the masses. It requires unique effort (such as creating custom plans or blueprints) that is not easily replicated for the next client. It requires more time and input from an actual human who has sufficient experience to design your unique solution. It also allows for your website to stand out and not be a cookie-cutter site. You’ll need to purchase a lot before you can build a custom home. Likewise, on the Web you’ll need a domain name (the address of the website) and a hosting server (the physical location where your website files will reside) in order to make your website available to visit. Unlike real estate, there aren’t necessarily good or bad areas in which to purchase your “lot.” You do want a good, memorable domain name and it is certainly worthwhile to find a hosting provider that is reliable. To build a great house you need to have great blueprints. An architect’s job is to understand what it is you want in a house and to create plans for the builders to follow. This makes sure you get what you want and that you know how much it will cost when it’s done. 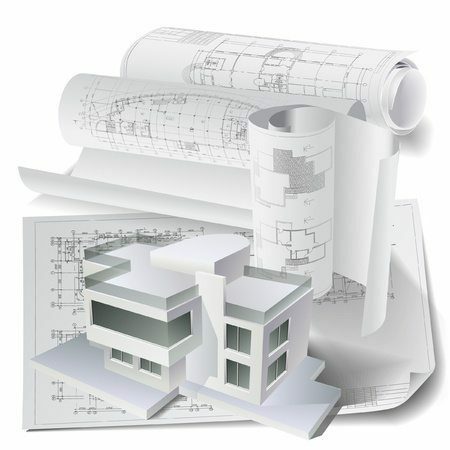 An architect needs a lot of information from you before he or she can create accurate blueprints. It isn’t enough to say, “I want a house with 4 bedrooms and 3 bathrooms. ”Likewise, getting an accurate assessment of the costs and timeline for building a website requires more than a brief description such as, “I want a website that will allow me to sell my products.”Many people undervalue the step of documenting a website’s requirements. Like a custom home, a website will be better constructed if set plans are followed. Because there are so many do-it-yourself websites, it can be confusing for customers as to why a custom website from a professional firm may cost thousands of dollars while there are so many instant website offerings at a fraction of the price. The difference in quality isn’t always immediately apparent on a website. Quality is usually reflected in items that are less visible. The longevity of the product, the customer service during the project, and the expertise in assembling/constructing are all reasons to choose quality over low price in both homes and websites. Once your home is built it gets quite expensive to change things. If you’ve built a 4-bedroom home, adding a 5th bedroom isn’t going to be cheap. Although websites are far more flexible than homes, the same principle applies. Once your website is built it is more expensive to make changes than it would have been had you asked for the feature at the beginning of the project.